Can you export Danish Bicycle know-how? The short answer is yes. Danish municipalities and consultants have a lot of knowledge that can benefit other countries in their efforts to improve conditions for cyclists. Many foreign cities have discovered the benefits of using Danish bicycle know-how. In recent years, many Danes have presented their bicycle-related work at international conferences, and several consultants are involved in international projects. So, to an extent, the export of Danish bicycle know-how is already in progress. International clients greatly appreciate the advice of Danish consultants who can contribute with experiences and know-how from a recognised cycle country. Yet, it is of key importance to study and understand local context because Danish bicycle know-how does not always translate directly into the conditions of other countries in terms of culture, prevalence of cycling, or legislation. So, the objective is to take the best from Denmark and adapt it to the other country’s conditions for cycling. 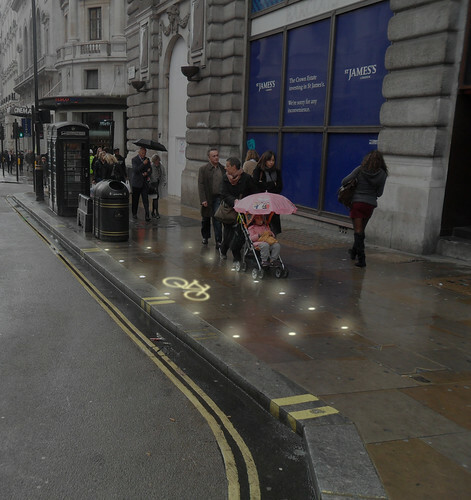 For instance, Atkins Danmark was involved in a traffic-calming project on Regent Street in London. The first visible initiative was a (Tokyo) Shibuya-inspired pedestrian crossing at Oxford Circus. Some of the project’s overall goals were to create better conditions for cyclists and pedestrians and to limit the number of busses and cars through traffic calming. The Danish contribution to the project consisted of developing infrastructure and innovative solutions for cyclists, parking, various service initiatives such as flexible bicycle parking on sidewalks, and designing bike racks that fit into the urban space while respecting the expression and history of the street. However, cultural differences appeared when it came picking the equipment. The type of bike rack characteristic of Denmark, where the front wheel of the bike is fixed in the rack, is unthinkable in Great Britain and other countries. There, the Sheffield, or staple, racks are prevalent. Out of respect for the historical expression of Regent Street and the client’s preferences, the Sheffield rack was redesigned so that the icon for the borough of Westminster, where Regent Street is located, became the general mark. 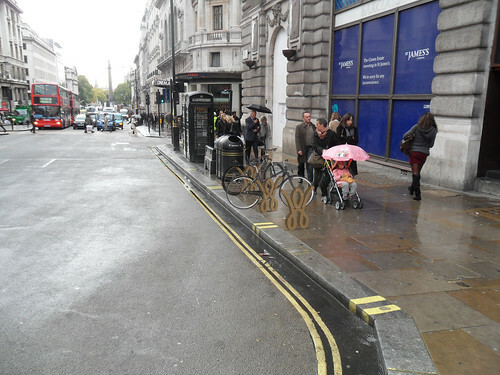 The result is a bike rack that fades into the urban space as it is in line with the design of lampposts, rubbish bins, and phone booths (the ‘classic red’ British phone booths in Regent Street are black and gold, like the rest of the city-owned equipment). Although the need for bicycle parking is much less than in Denmark, it can still be difficult to find the necessary space. Regent Street has a lot of very wide sidewalks, but it also has a high number of pedestrians – albeit primarily during the shops’ opening hours. Therefore, flexible bicycle parking was introduced. Here, areas for bicycle parking on the sidewalk are discretely marked in the pavement by lights that are on in the evening and at night when bicycle parking is needed. Another example is the characteristic Danish blue bike lanes marking the bike paths. These are completely unthinkable in Regent Street, which is a historical street where special architectural features must be considered. As an alternative to the blue lanes, the solution was a very light change where a small lowering makes drivers and cyclists aware of what is roadway and what is cycle path.